Lt Martin L. Clark (P) - Flew as CoPilot for three different crews: Eight missions with 1Lt William J. Monahan (54, 56, 57, 58, 59, 60, 61, 64). Was briefly hospitalized when the Monahan Crew was shot down on mission #65 on 31 August 1943 on which he did not fly; Three missions with 1Lt Arni L. Sumarlidason (69, 73, 74); Three missions with 2Lt Paul W. Campbell (75, 76, 77). Upgraded from CoPilot to Pilot on orders dated 26 October 1943 and flew his first of eleven 1st Pilot missions on 1 December 1943 with three different CoPilots: Two with 2Lt Jack W. Watson (86, 88 as combat orientation Pilot); One with 1Lt George E. Wright (94); Eight with 1Lt Julius E. Bass (89, 91, 95, 97, 100, 101, 103, 104). 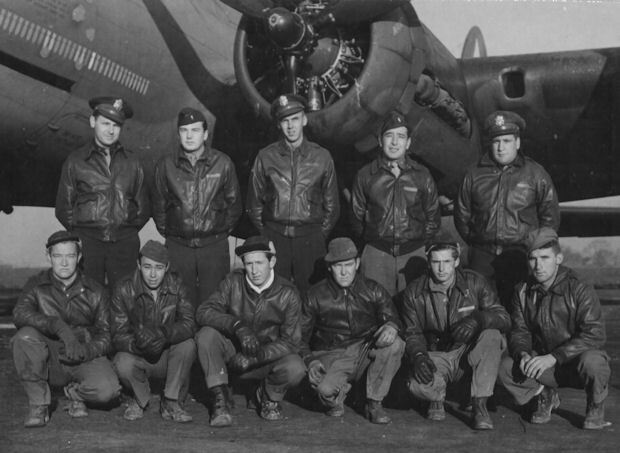 Twenty-five mission combat tour completed on 4 February 1944.